Ráistín is the official Irish form of Clonmellon, Co. Westmeath. Clonmellon and Ráistín are two distinct and unrelated placenames, both referring to the one feature, namely, the town in County Westmeath. Both names are apparently of Irish origin. Clonmellon is also the name of the townland in which most of the town is situated. Extensive research of the name would suggest that Clonmellon is not an old name, as, evidentially, it does not appear at all in any of the main seventeenth-century historical sources (such as The Inquisitions of Leinster, The Down Survey (1665), The Census of Ireland (1659), The Books of Survey and Distribution (1660)) or in primary sources relating to this and to other areas in the previous century (such as The Fiants of Elizabeth, 1558–1603). Clonmellon is first recorded in print on Taylor and Skinner’s map of the roads of Ireland of 1778, and occurs as a post-town in Leet, 1812, and as a market and post-town containing 960 inhabitants in Lewis, 1837. The Ordnance Survey conducted fieldwork in the area of Clonmellon in 1837. A letter from Hugh Dillon, agent to Sir Thomas Chapman, to Lieutenant Wynne dated 11/3/1837 states: “The town of Clonmellon was first commenced by the late Sir Benjamin Chapman about between sixty and seventy years ago and got its name from a moat near the town called ‘Cruckmillion’”. (Placenames of Westmeath p. 46, ed. P. Walsh). In the Ordnance Survey Name Book of the same year the Irish form of Clonmellon appears somewhat uncertainly as Cluain Mealainn (with -e- deleted). However, in a letter dated 19/10/1837, John O’Donovan of the Survey remarks: “The pattern of the parish of Killua was held at Clonmellon, now generally called Raiskeen” (Ordance Survey Letters, Westmeath, II 124). O’Donovan does not suggest an Irish form of ‘Raiskeen’ but the name occurs in an Irish-language source written some years later. 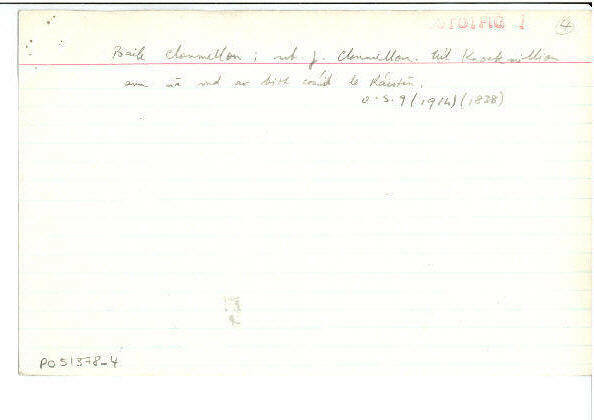 In a text compiled by a well-known Irish scholar in the period 1840–1854 which was published under the title ‘A Meath phrase-list in Hugh McDonnell’s handwriting’ (Éigse 5, (1945–7), 36–44, ed. É. Ó Tuathail) the name Ráistín appears as follows: ‘Bhí mé a’ caint le fear a shiubhail ó Bhail’ Áth’ Luain ann a’ Mhuilinn Chirr agus ó sin go Rasdien agus as sin go Ceanadus’ (ibid. 42, line 236). This is translated directly by the author of the text, Hugh McDonnell (Aodh Mac Domhnaill), ‘I was speaking to a man who travelled from Athlone to Mullingar, and from thence to Clonmellon, and from that to Kells’. It is interesting to note that Seosamh Laoide in his Post-Sheanchas, Cuid I (1905), p. 49, gives the Irish name of the town as ‘Cluain Mioláin nó Ráiscín’. While not always the most reliable source for the Irish versions of placenames, Seosamh Laoide was very familiar with the Irish of north Leinster and would be regarded as reliable in this instance. Of more immediate interest is the fact that Ráistín or Ráiscín survived as the local English name of the town of Clonmellon until recently. 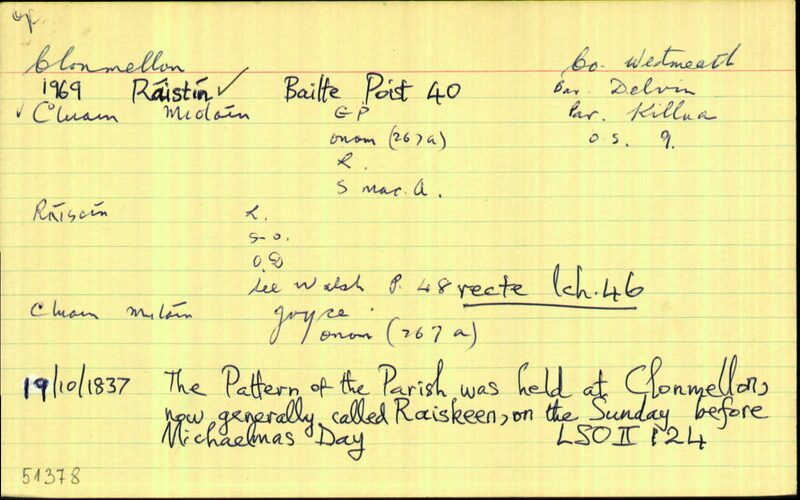 A handwritten note written by an officer in the Placenames Branch of the Ordnance Survey during in the early 1960s while engaged in fieldwork on the post towns of Ireland in preparation for Ainmneacha Gaeilge na mBailte Poist (1969) states: ‘tá Krokmeljon taobh istigh den Demesne’ (quoting a Mr Fleeton in the area). However, the predominant form mentioned is Rawsdeen (an informant from nearby Archerstown — this latter spelling of the name is an approximate phonetical one), Rawsgeen (Mr Fleeton), ‘The fair of Rawsgeen — Rawsgeen a tugtaí ar an áit le linn m’óige’ [‘It was called Rawsgeen in my childhood’] (Mr. Fleeton). ‘Cluain Mioláin’ was used as the Irish form of the postal town by the Department of Post and Telegraphs before the making of the 1975 Placenames Order. This is the same form as that given by Seosamh Laoide as an alternative Irish name of the the town. 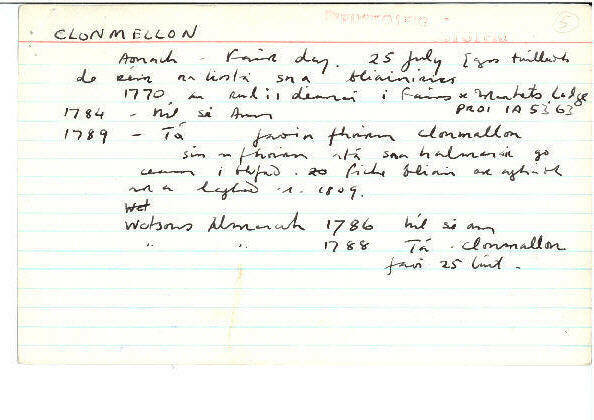 This form would appear to be based on a entry in the Annals of the Four Masters (AFM, 1856) under the year 785 : Iomaireacc Cluana Miolain ‘the battle of Cluain Miolain’ (AFM I 392). John O’Donovan, the editor of the Four Masters, identifies this placename with Clonmellon in County Westmeath (AFM I 393, footnote o), incorrectly in the opinion of later scholars however. 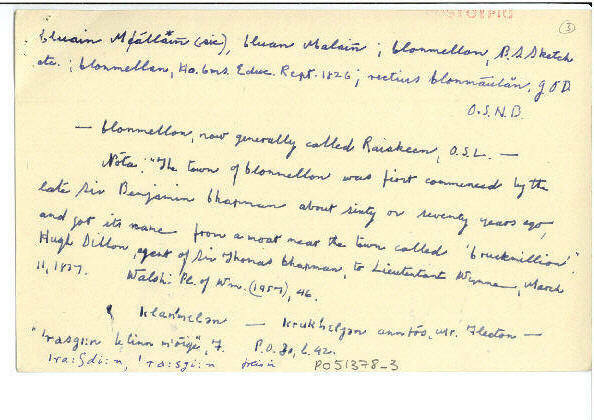 Edmund Hogan in his Onomasticon Goedelicum (1910), p. 267, quotes the AFM reference but adds that it ‘may be near McCarthy’s Clomellane Castle in the parish of Molahiffe, County Kerry’. The name Clonmellon is not recorded until the last quarter of the eighteenth century. Local evidence suggests that the name was artificially created as the name of the town founded by Sir Benjamin Chapman about 1770 and was based on the name of a local moat, recorded by the Ordnance Survey as Cruckmillion in 1837 and as Krockmeljon by the Placenames Branch in 1960. 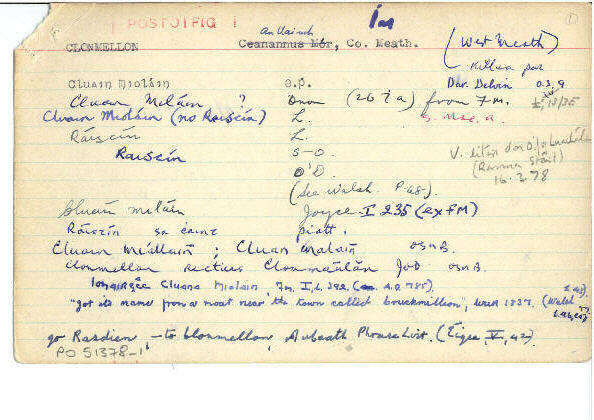 The form ‘Cluain Mioláin’ is apparently based on a name found in the Annals of the Four Masters which was misidentified by the editor as referring to Clonmellon. Ráistín, or its variants, is recorded as the local English name of the town from 1837 to 1960. It is also recorded in a reliable Irish language source as the Irish name of the town in the 1840s. 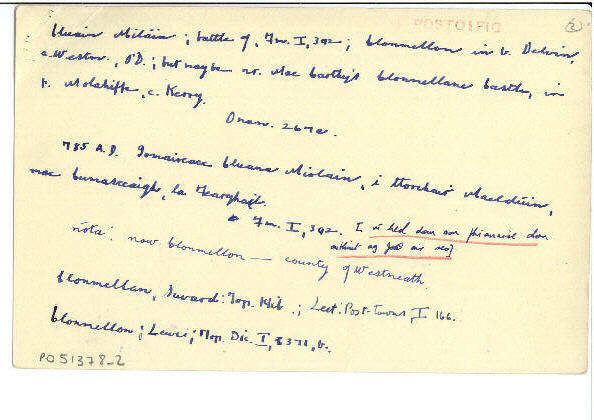 In conclusion, the evidence shows that Ráistín was the traditional Irish name of Clonmellon used by native speakers of Irish in the Westmeath/Meath area in the nineteenth century. There is no evidence to show that any other Irish-language name was used in reference to the town.